(CNN) -- Nobel Prize-winning democracy activist Aung San Suu Kyi met with her doctor Monday after being barred from seeing him over the weekend, a spokesman for her party told CNN. Pro-democracy supporters hold a portrait of Aung San Suu Kyi in New Delhi, India. Dr. Pyone Moe Ei saw Suu Kyi on Friday, but was denied permission to see her the next day, National League for Democracy spokesman Nyan Win said. The Myanmar opposition leader is showing signs of dehydration and low blood pressure, Nyan Win said. The doctor put her on an intravenous drip Friday, Nyan Win said. Although it was not clear what the IV was providing, patients in danger of dehydration are often given a solution of sodium chloride (salt) in water, commonly referred to as normal saline. Suu Kyi's condition is unclear, and her doctor -- who is not her regular physician -- is still waiting for the results of her physical examination, the party spokesman said. Suu Kyi's main doctor, Tin Myo Win, was unexpectedly arrested on Thursday, Nyan Win said. The charge is unknown. The doctor and his wife have never been involved in politics, Nyan Win said. The arrest of the doctor followed the detention Wednesday of an American man who reportedly swam across a lake to gain access to Suu Kyi's house. Nyan Win said Myanmar's military rulers had put up more barriers around her house, apparently as a result of the intrusion. The wooden piles and barbed wire fences were recently placed at the back of her house which faces the lake, the spokesman said. Suu Kyi, 63, has been under house arrest for 13 of the past 19 years, and is rarely allowed visitors except for her doctor. Her detention is currently scheduled to end May 27. The military junta cannot legally extend her house arrest any longer, Nyan Win said. "According to the law, if they extend the detention, it will be an infringement," he said. "We hope that from the present international pressure ... she will be released." 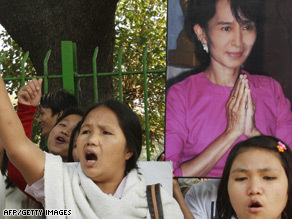 Suu Kyi was first detained in 1989 and authorities have extended her detention regularly. She won the Nobel Peace Prize in 1991. The U.S. State Department said Monday it was "concerned" about the government detaining Suu Kyi's personal physician and withholding medical care from her. "As the anniversary of her detention approaches," the State Department said in a release, "we are reminded that the house arrest of Aung San Suu Kyi is unjust. We join with the calls of the international community and urge her immediate release, along with the release of all the more than 2,100 political prisoners the Burmese regime currently holds." Suu Kyi rose to global prominence during protests in the southeast Asian country in 1988. She was placed under house arrest before her party won the 1990 general elections, which the ruling military junta did not recognize. Myanmar's government has scheduled elections for next year that it says will lead the nation toward democracy. Human rights organizations have said the vote will merely extend military rule.